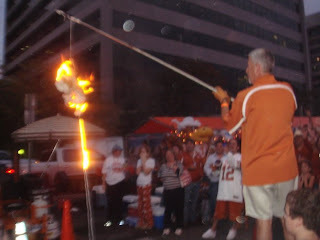 Reveille dangles limply from a string attached to a long stick as a Longhorn fan tries repeatedly to ignite the sad dog. Finally the spark takes, and the Texas A&M mascot turns into pure flame lifted aloft as an offering to the gods of football. This is tailgating taken to the monied extremes. Like fajitas once were the meat that only poor people ate (and fajitas were never chicken), like punk rock was once rebellious, the University of Texas tailgate—some outdoor grilling you did to while the time with family and friends after assuring yourself of an early and reliable parking spot—has gone corporate. State employee lots that once were seen as prime game-day parking are now Austin’s Disneyland complete with corporate sponsors. It works like this: put up the banner of Bland Light and get 25 cases of tasteless corporate beer to hand out to your friends and coworkers. Entire areas are roped off for a jumbo party that spills, beer can in hand, to near the refurbished, expanded, corporate-box-added stadium where Sports Illustrated has its tent offering free copies of the latest special issue. Power, fun, safety and belonging. Those are the four basic human emotional needs, and all are for sale here today, Longhorn Inc. says. Wear our team colors, drink some more Boring Light. Come to the stadium food court (now open during the school week!) for a $6.50 chopped barbecue sandwich or two chicken tenders for $10. Yell from your seats at the idiots from College Station. Revel in how much better your team is. They are fools and losers. Today is Thanksgiving. We give thanks that we are not you. I've always liked this photo. That's me at about age 5 with the missing front teeth and my sister Clare. 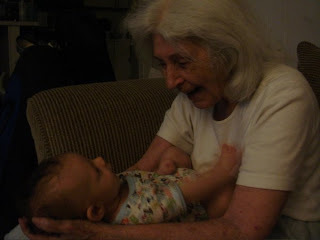 My mother passed away Sunday morning after a long and interesting life. A few years back she asked me to interview her about her life. I turned to that to write her obituary. I left out some of the wilder details. Her grandfather, who was a doctor, is believed to have killed her grandmother in order to be with his nurse, whom he later married. My mother's father carried this around with him and it made him into a mean, scary drunk who, when my mother was two years old, beat her black and blue. She didn't see him again until she was 15. And her mother, a real party girl would leave her young daughter at home alone while she went out partying. It's amazing the life my mother forged with this sort of beginning. Wylma Louise “Cassie” Castleberry O’Connell Ruelke died Sunday, Nov. 16, peacefully at her Austin home. She was born April 10, 1927, in Oak Grove, Louisiana, the only child of Lucille Agnes Scarborough and William Thomas Castleberry, a pair of restless school dropouts who accounted for a combined dozen marriages in their lifetimes. Cassie was raised primarily in Houston, but also lived in Florida, Ohio and different parts of Texas as her mother and a string of stepfathers sought work. As a child, she was told by a handwriting analyst that she was most likely to see life’s glass as half full, and this optimistic philosophy steered her through a dirt-poor and often abusive childhood toward a life that might have seemed beyond her reach. She never dated in high school and never entered a restaurant until she was in her 20s. Three things changed her life: the opening of a public library branch in the basement of her Houston elementary school that introduced her to a love of novels, in particular a series of mysteries involving a globetrotting archeologist; her friendship with elementary school classmates Barbara Tierney and Shirley Jones who convinced her to join them in a pact to one day become nurses; and a high school job at the Piggly Wiggly deli counter that introduced her to such exotic fare as camembert cheese and herring roll mops. Despite her mother’s best efforts to stop her, including bribing her with promises of an automobile, Cassie went to nursing school to earn her associates degree, working at Hermann Hospital and in Galveston, where she aided the injured during the 1947 Texas City disaster that killed 581 people and so strained hospital resources that the Hotel Galvez had to send over its beds that soon filled the hospital hallways. It was later in the lobby of the Hotel Galvez that she would meet her first husband, William Robert O’Connell, who was in town for an architecture convention. Cassie was on a date with another architect, but was soon joining O’Connell for dinner in the swanky Balinese Room. After she moved to Austin to complete her R.N. degree at the University of Texas, they married in 1952 (on a date scheduled around Texas Longhorn football games), but not before she extracted the promise that they have a dozen children. He reneged on the promise after six kids. They divorced in 1966 and she subsequently moved her children to Colorado and married Hans Ruelke, who died two years later in a car crash. 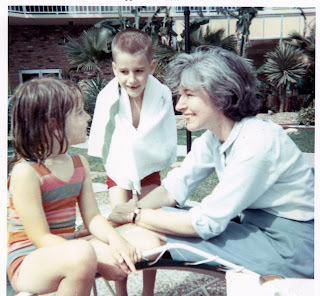 The family moved back to Austin, where she raised her kids, earned a master’s degree at the University of Texas and served as administrator of the Austin State Hospital’s Deaf Unit. A deep spiritual longing was alive in her from a young age. She thought she might drown when at age 11 she was dunked three times in water and became a Baptist. In her 20s she converted to Catholicism. While in graduate school, she took philosophy classes from famed Indian novelist Raja Rao, which led her to travel to India in search of truth. For more than two decades she split her time between India and with her family in Austin. Survivors include sons William Robert O’Connell II of North Carolina, Daniel Pius O’Connell and wife Tarla, Casey John O’Connell and wife Magali, and Joseph Matthew O’Connell and wife Tiffany of Taylor; daughters Mary Ann O’Connell Harvey and Ann Clare O’Connell, both of Austin; and grandchildren Russell Tipp Harvey, William Wesley Harvey, Shanthi O’Connell and Nicholas Drake O’Connell. In lieu of flowers, donations may be made to the Sri Atmananda Memorial School of Austin. Cassie’s ashes will be scattered in India’s Pampa River. An Austin celebration of her life is being planned by her family. This is response to all of those memes I've ignored! 1. I was once (heavy on the once) a fencer in college. I competed in one tournament in the foil and beat one guy, an Aggie. 2. I lived in India for three months when I was 14. Two of brothers still live there. 3. In high school I was in a work program for potential dropouts. 4. In college I was kinda, sorta, maybe student body vice president. 5. I start every day by drinking skunk juice: a mix of garlic, green super foods, apple cider vinegar and fruit juice. That explains my breath!